Peter Spacek with his daughter at a signing for his cartoon compilation "Surf And Mirth"
Although surf art was not how Peter got started in illustration, it has slowly eclipsed his former work as a freelance illustrator for such publications as the New York Times and Reader’s Digest. Peter now splits his time between San Diego and New York, and I recently had a chance to catch up with him over a cup of coffee at Surf Dog’s Java Hut in Encinitas to talk about his roots, his business, and his thoughts on surfing today. I spent my formative years in Santa Barbara. My family moved there when I was 7. But we’re all from Europe. I was born in Germany, and my parents are Czech. They were refugees from the war pretty much. They came over in 1957 in a boat full of refugees, and I was one of them. I was two years old. We came to New York and we lived there for six months. The weird part is that I found this old map with Montauk on it, and it has an “X” on Montauk in my dad’s handwriting. And he goes “Oh yeah we took a trip out on Long Island, I wanted to explore around,” so I think when I was 2 or 3 years old we went to Montauk. I think we maybe camped at Hither Hills. [laughs] So maybe I was drawn back there later in life. My dad was really anti-artist. He had a brother who was a full-on bohemian artist-architect-painter. My dad went the other way, he was an engineer. He thought it was all BS. They were always butting heads. He got a job at General Motors doing electronics, so we had to move to Flint, Michigan. I went through first grade there, and I was actually one of the first of my family to learn English – we all spoke German. Then my dad found an opening at the General Motors plant in Goleta, and he said he wanted to go to California. So we drove across the country in a station wagon and lived up in Santa Barbara. So I became a California / Santa Barbara kid. I went through city college in Santa Barbara, and then I moved to San Diego and went to San Diego state to study art. That was when I was 20 or so. I did the usual partying thing, and met all the surfers there. We decided to move to Mission Beach, and then forget it. I finally just had to drop out – I mean we were learning nothing. I mean, I wasn’t – I wanted to go surf! I didn’t want to drive eleven miles inland to go to school. So I dropped out. I showed up at home and told them “I want to go to Hawaii, I want to go surf.” I just wanted to go for as long as it took, I had to get it out of my system. I really had it bad. They were reeling—like, “What went wrong?” So I had my backpack and my board, I bought the one way air ticket, and I’m putting canned food in my backpack as I’m going out the door [laughs]. I decided I wasn’t going to go to the North Shore, I went to Kauai since I knew someone there. When I got there and I got a mask and spear and decided I was going to spearfish and live in the woods. I just needed a purging like that. So I made a little camp in the woods and I was just immediately hated by everyone, the local guys. Hawaii was full of Californians showing up and trying to do the same thing. They showed up and expected to be taken in and accepted. So there was a lot of that? Well not a lot, but enough. A lot of surf bums. So it took me about seven or eight days to realize it wasn’t really for me. But I decided I wanted to stick it out. I got some awesome waves in Hanalei bay. I quickly ran out of money – I remember buying big containers of oatmeal at the store because that really lasted and stuck to the ribs. I was eating a lot of coconuts. At the same time I kind of liked it, the grubbiness of it. I didn’t really like the other guys like me who were hanging out trying to do the same thing; everyone was kind of in survival mode. You were competing for waves, space. There wasn’t really that feeling you wanted to have. That’s interesting; you kind of think of Hawaii at that time being like this utopia of surfing. What did you do in the Carnival? Well, it was pretty funny. I was employed to help run the Tilt-A-Whirl: set it up, take it down. The guys at the carnival quickly realized I wasn’t an idiot, and within the first forty minutes I’m completely operating the Tilt-A-Whirl. So to this day I will not go on any carnival rides because I knew nothing! And there I was with the hydraulics, loading up the people, taking it up as far as I felt like. Then the guys come over in the evening and they get me super high. I get back on the controls and I’m making it go too high and I’m hitting the decking and people are screaming. [laughs] But it was from noon to midnight working on this thing, and it was just grueling. I slept underneath the ride at night, mosquitoes everywhere. I had these coils burning on the grass trying to keep them away. It was just misery on top of misery. And then the last day you worked from midnight to midnight and then you had to help them load the ride on barges. So after that I was ready to bail out of there. I waited for the money to be delivered and after taxes I think it was like 89 dollars or something crazy like that. But I had a couple of great days at Hanalei bay, and I met some nice people. And there were some days that stuck out so it wasn’t that miserable. But I quickly realized I didn’t want to be doing it. Surfing wasn’t enough. Hawaii wasn’t that paradise, really. Not in that situation. I didn’t have quite enough money to get back, so I called my parents and they wired me the extra money I needed. I had to hitchhike to the airport the evening before so I could catch my flight in the morning. I slept next to the runway and I remember it was torrentially raining. I had this tarp over me, and I recall my body under the tarp with puddles all the way around in a perfect body shape. When I came back I told my parents that I’d like to go back to school. They didn’t really say much, but they supported me. That kind of straightened me out, and I took it more seriously. I went back to school and did well in illustration and design. There was a contest put on by the Navy for a recruitment poster, sponsored by an ad agency. I won the contest, and afterwords the agency asked if I wanted to help them out. It was Wilson Frank and Associates, downtown. I hadn’t finished school at San Diego State, but I was working at an ad agency as an artist / designer. I was 22, and my dad realized I could actually make a living doing what I did and he felt better about it all. That’s what I did for about two or three years. This one guy that used to work there went off to go to school at Art Center in LA. When he came back he showed me this unreal art that he had done up there. And I couldn’t believe what happened to him in a year of him going to that school. I thought this [the agency] was great for me, but [the art school] was what I really wanted to be doing. That’s what the value in art school is; you’re around people who are really good and then everything is ratcheted up. It’s inspirational. So I applied there and got in, so I moved from San Diego to Pasadena. After I graduated they looked at my portfolio and they told me I needed to go to New York. I had that whimsical magazine-style art, and all the magazines were in New York. LA was more entertainment industry and realistic artwork. So I thought, “Well there’s that Montauk place…” [laughs]. So I said well, I’ll go and check it out. I drove across the country and got an apartment in Brooklyn. It was the middle of winter, so as soon as it warmed up in spring I drove out to Montauk. I thought, “Well this is only two hours away, so maybe I can do this.” So that first summer with the pickup truck with the camper shell I camped illegally around the Hamptons and surfed. There was one surf shop in the Hamptons at that time; Seasonings in Amagansett. It was the only one back in ’80, ’81. So I was hooked. I loved it right off the bat. But I had to live in the city, live in Brooklyn. Eventually I was able to afford a rent share in Montauk. So that’s how I ended up in Montauk again. So just full circle. When did you find your dad’s map? You were always into illustration? I was always a drawer. I got my first stamp of approval from my teacher in fifth grade – my teacher told my parents that I should be an artist. My dad didn’t think that was such a good suggestion. But my uncle, the artist, was always encouraging me. I wanted to be like him. He was an amazing architect and an amazing painter. He had the Porsche, my dad had the Volkswagen van. I kinda wanted to prove to my dad that I could do it. When I had my first drawing published in the New York Times I cut it out and sent it to him, and he was actually the proudest. He was showing it to everyone at work. He kinda came around. It meant a lot to me. When you moved to New York where did you get a job? Peter's scrimshaw drawing on old pieces of surfboards. I had this double major, advertising and illustration, where you’re supposed to learn how to be an art director and create an ad. Maybe because of my dad I was a little worried about just doing freelance illustration, waiting for someone to hire you. I was a nobody. The school had a reputation, so you could get a position as an assistant art director to start. So eventually I did. At the same time I would take my illustration portfolio around and get that ball rolling. Four years later I was able to make more money doing freelance illustration than at the regular job. That’s when I began to just do illustration. It’s a lot of waiting around, waiting for someone to call. It’s nerve wracking. You put your name out, and there were directories. You could take your portfolio around and drop it off. It always seems to come in clusters where you get six jobs on top of each other and then do nothing for a week. I don’t do that as much now because I have the greeting card business and do a regular cartoon for the East Hampton Star. The show [at OutEast gallery] was really my first fine art show, and I’m really excited about that. People seemed to want some of that stuff. So I’m working on that, and my board scrimshaw where I drew on pieces of old surfboards. That seems to be very popular, it takes advantages to drawing. There’s more depth to it, it’s more sculptural. One of them was a board you shaped, correct? Yeah I pulled it out of my mom’s shed three or four months ago. It was so rotten and yellow. It was perfect. Have you shaped a lot of boards? Well I was always trying something new. I didn’t like the boards in the 70’s. It was either longboards or these super gunny pintails. They didn’t work most of the time. There was no such thing as a funshape or whatever. There were these old longboards left over from the 60’s – which we loved and rode em. Got them for next to nothing. As shortboards were getting figured out they were only worked when it was really big and great, surf wise. So I decided I wanted something that was like a longboard but shorter. So I just decided to make my own. So I made three or four, very crudely. The cruder the better [laughs]. So they were the first…what would you say? Fat shortboards? I remember taking one to Malibu, and the crowd was on the beach going “wow look at that board!” They said it was very progressive. I was like not really, I just wanted something that was fun to surf. But now I’ve chopped them to bits and used them for scrimshaw. How did you get started with the greeting cards? Was it a natural extension of what you were doing? I had already worked for a lot of other greeting card companies. When I was in New York I was a freelance illustrator and that’s basically what I did for a living. I worked for Hallmark and a few others. I always thought the stuff we did was kind of lame and I didn’t really like it. I thought it could be better. So I thought about doing my own line of greeting cards. But this was back when surfing wasn’t really that mainstream and still sort of underground. I never really believed I could combine the cards with the surf art I did for fun—that was something I did separately, it wasn’t for profit. But then things started to change, and surfing became big time. I decided to try to put it out there. And it really all started with Wetiquette, the book I wrote about surfing etiquette. Surfing was starting to get really popular at Ditch Plains (Montauk), and everybody was showing up with their brand new boards and paddling out. They didn’t know how to surf at all. [laughs] I thought, well, someone really has to put the rules down. I’d never seen it actually written down or anything. It wasn’t really discussed…it was just, “You’re a kook, you don’t know what you’re doing.” I didn’t know if there’d be enough to make it into a book, but after thinking it through I realized there was. I took it through the entire surfing experience; getting yourself to the beach, checking it out, where to paddle out, how to act once you’re out there. I put it together and self-published it. Tony [Caramanico] told me to go down to Surf Expo in Florida and sell it. I was a little unsure about that idea since Wetiquette was just a small book, so I decided to whip together a few greeting cards as well. I had been doing them for some friends anyway, and I came up with 10 or 12 greeting cards. Basically ones I had already done. Actually, the Museum of Modern Art [MoMA] does a contest and I had entered a few designs and won. So my first greeting cards, surprisingly enough, were actually for sale at MoMA. It was great. This was before the surfing culture really kind of existed. You walked into the Museum of Modern art gift shop and there was this goofy Santa with a surfboard on his head, and a reindeer on top of that, and they were surfing together. But that gave me some confidence. I knew there was a possible market for it. So I had those two [from MoMA], and I had a few more over the years. So I took it all to surf expo. Wetiquette did pretty well, but they also liked the greeting cards. So I got a bunch of orders for those cards and that’s how it started. I mean, you’re next to Quiksilver and this big showbiz stuff, but it was positive. I got orders, and when I got back I immediately had to learn how to have this business going. Before that people would just hire me for freelance illustration work. But with the way the economy’s going it was a good income supplement. I talked to greeting card reps who thought it was a good, novel idea, but they told me I needed at least 40 cards. So I had to go back and create 30 more. So that’s how it started. Where have you traveled? Where do you like the best? I just wanted to see the world. Surfing was a great way to go to places that were off the beaten path. It gave you a structure for how you were gonna see the world. I went to Hawaii a few seasons in a row when I was in New York. I started making enough money in New York where I realized I could take time off and travel. Reading Surfer magazine over the years gave me a lot of ideas of where I wanted to go. I went to Portugal a few seasons. I was living with a woman at the time and she lost her job, so I go, “Oh great! Now we can go on a round the world trip!” So it was a great opportunity to go. At the time this one airline was doing round the world tickets, as long as you kept going in one direction you could make as many stops as you wanted. It was great, we took two months and did that. I think I went to Teaupoo in Tahiti…it wasn’t very big but it was gnarly. I love the tropics, but I hate getting ripped to shreds by coral. I just don’t like getting bloodied constantly which I swear it is half the time there [laughs]. Tahiti, New Zealand, Australia, France, Portugal, Spain. I love that whole European coast. I have piles of sketchbooks full of sketches from places I’ve been. I try to make it one page per day when I go. Like the Indo piece I did; it’s an illustrated diary. That’s what you did for Surfer’s Journal right? Yeah that was with Russell Drumm. He told them we were going to go, and maybe we could do a story, and they said, “Well, let’s see what you come up with.” It wasn’t like an assignment or anything. So I just decided to draw every day. Was that the first time you were in Surfer’s Journal? I’ve done a couple little spots for them. Sometimes in the back they have a little cartoon. I actually knew the art director from when he worked at Surfer because I worked with them a little too in the 80’s. But I love to draw when I travel. I think that’s my most natural work when I’m just sketching in sketchbooks. They just happen; I can’t really recreate it. What really inspires your work? It’s just a stream of consciousness. Something might occur to me and I’ll draw it. It’s usually something I find kind of funny, or a what-if. I’ll draw it and usually something else pops to mind about something related to it. Then you have a stream of visual thought running down the page. I like concepts. I’m not a landscape guy. I mean, I can sit down and draw real life stuff, but it’s usually more of an idea or something that came to mind that was ironic. Something to get off my chest. That’s kind of how I let my feelings be known, perhaps. People look through the sketchbooks and they go, “You are one sick motherf—er.” [laughs]. So I guess it’s kind of a corny expression, but I suppose it’s how I express myself. 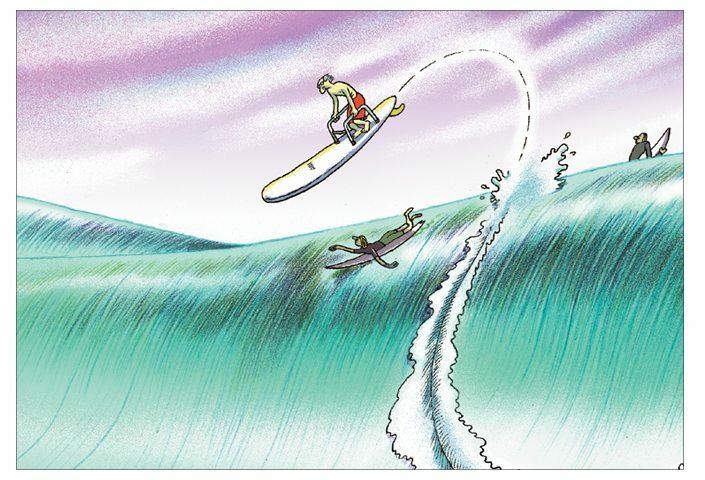 Since you actually wrote “the book” on Surf Etiquette, what’s your pet peeve when you’re out in the water? What’s the number one rule you hate to see people break? The non-communicating really drives me crazy, where people are sitting there all stoically next to each other. I mean, all you gotta say is, “Going left!” Which way are you going? It’s that BS vibe. It’s not so much in New York–it is more now–but here [in California]. You’d think it would be this brotherhood of surfers and everyone’s getting along in the water, but everyone is very prickly. And [people say] you’re riding the wrong board or whatever. The way I look at it, everyone surfs and they should all get along. But it’s not. The longboarders don’t like the shortboarders, and the shortboarders don’t like the fish riders. And everyone subdivides, creating smaller coalitions to oppose the other group. It’s this bad reflection of human nature. The comfort zone gets to me also, giving other people some space in the water. But it’s basically the unnecessary posturing and not talking. It becomes this arena for alpha males, and they all want to come to the same spot so they can stuff each other. There could be another great wave just down the beach. How do you feel surf culture has changed since you started? It was an underground, off the grid eccentric thing. But now it’s become more commonplace like it kind of is in Australia. More people talk about it. In the old days if there was a surfer in an advertisement it was really novel, but now it’s so common. There [in Australia] I remember asking this surfer if they knew what the tide was, and this elderly couple chimed in and said, “High tide’s at 4:00 and I think the wind’s turning offshore around 12!” Everyone knew everything, like the way football is here. It’s become this fashion thing now, and that’s a big part of it. I had a nutty group of friends and we kind of made it mystical in a way, and we were all trying to get to that magic point. To us there was some voodoo to the whole thing, with a certain board. It was kind of a religion in a way. I don’t know if it’s still like that to people. **All images courtesy of and copyright © Peter Spacek. I don’t know if this gets to Peter, but if you could pass this on to him? This is his old friend from Santa Barbara, we grew up surfing together with Derek and Fred. Please email me to catch up. i am still thinking about that one piece in his show that we all loved so much. i don’t want him to sell it so that i can continue to see it. or if i fall into extra money, just buy it. very nicely done…i’m a big fan of peters…..and now you. Thanks Hayley I so enjoyed reading about Peter. Great job! Good read! Like the scrimshaw. Nicely done Hayley! Loved it, I even learned a few more facts about Peter!